Drexel freshman squash player Nick DiDonado strikes the ball Kline & Spector Squash Center at the John A Daskalakis Center. DiDonado beat Swarthmore’s Jora Dhaliwal in straight sets 11-0, 11-3, 11-5. 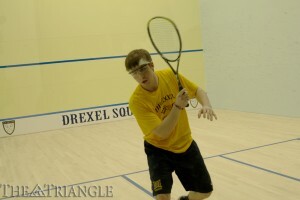 The Drexel men’s and women’s squash teams’ first regular season as varsity programs left the women (0-11) finishing off the regular season at home losing to Brown University 0-9 Feb. 4. The men (7-9) split matches against Brown and Swarthmore College Feb. 4 and 8, respectively. The men lost to Brown 1-8 but defeated Swarthmore in a comprehensive 9-0 victory. Brown would ultimately be a very difficult opponent for Drexel as sophomore Justin Singh had the only win for both the men and the women, beating Brown’s Blake Reinson 11-7, 11-8, 11-13, 10-12, 11-8. The win improved Singh’s record to 13-2 on the season. Freshman Sebastian Dangond Gala also took his match to three-plus games, although he fell to Brad Thompson 11-7, 4-11, 8-11, 7-11. Yet it was only Gala and Singh that were able to take their matches to four or more games, as every other Dragon lost in three games. Things did not fare any better for the women, as Brown won all nine matches in three games. The best effort for the women came from freshman Kiran Vasudevan, who lost her match to Brown’s Dori Rahbar 2-11, 7-11, 4-11. Speaking afterwards though, head coach John White was proud of his team’s efforts in their inaugural season. On the other side of the coin, the men completed their regular season in style against Swarthmore. Drexel won seven out of the nine matches in three straight games. Despite the fact that usual No. 1 Singh, along with two other main starters, did not play in this match, the men’s team stepped up to the plate and ultimately delivered. Temporary No. 1 Gala, at the top for the first time, comfortably won his match against Swarthmore’s Tarit Rao-Chakravorti 11-7, 11-7, 11-7. In what was perhaps the match of the night, sophomore No. 7 Kevin Sacherman had his match taken to five games against Collin Smith. Sacherman won the first two games 11-7, 11-3, but then lost the next two 5-11, 6-11. In the fifth and final game, he scratched out another 11-7 win, while fighting off a furious comeback from Smith. As the opening season draws to its conclusion, White spoke glowingly about the speed to which both teams have progressed this season. White, along with the rest of the team, is looking forward to the postseason, with the men taking part in the Men’s Teams’ Nationals Championships in Princeton, N.J. Feb. 17-19 and the women actively taking part in the Howe Cup Feb. 24-26. However, he is also aware of the fact that matters will surely get tougher in the future.